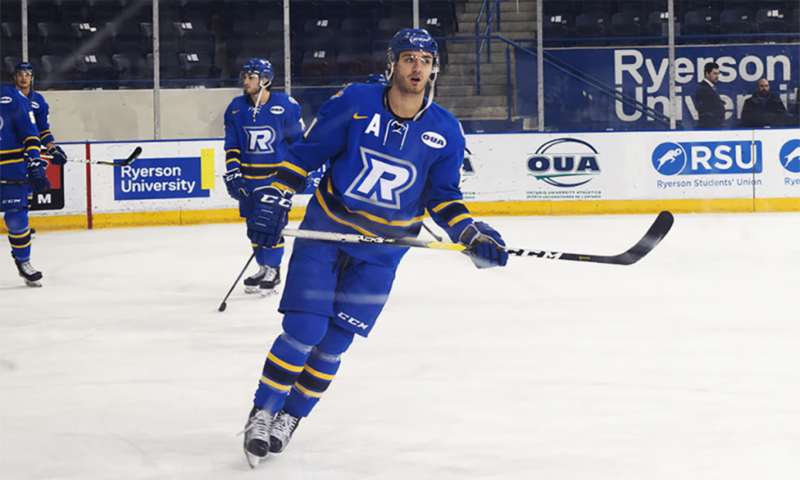 Boasting the best offence in the division, the Ryerson Rams’ men’s hockey team is firing on all cylinders this season. The team is leading Ontario University Athletics (OUA) in almost all offensive categories, including total goals, assists and goals per game. Their power play is operating at 28 per cent, one percentage point ahead of the second place team: Queen’s University. Head coach Johnny Duco attributes the team’s strong offence to the depth of his team. “We’ve got scoring from a lot of different areas,” Duco said. The team’s top line has carried the load offensively most of the year, said Duco. However, when they have had less productive periods, the team’s secondary scoring has stepped up. “We’ve had a lot of different guys contribute and I think that’s led [to] the offensive success we’ve had,” he said. The Rams have had many players step up offensively, but the offence has mainly come from the top line. Forwards Matthew Santos, Matt Mistele and Hayden McCool have led the way, with Mistele and Santos sitting first and third in points in all of U SPORTS. Santos said he has, in part, his linemates to thank for his strong rookie season. Even other teams know that when they come up against the Rams, if they can’t contain the team’s offence and that top line, they are in for a long night. Russell Herrington, the head coach of the men’s hockey team at York University, said he knows his team will have to limit mistakes when facing the Rams offence. Limiting turnovers and puck management are key when competing against any team in the league, said Herrington, adding that these skills are especially important when facing off against the Rams. “They can score right throughout their whole lineup,” he said. Herrington said both his team and other teams in the division know the Rams’ top line is dangerous. As great as the offence has been for the Rams, their defensive numbers aren’t quite at the same level. They allow an average of 3.56 goals per game which is 15th in the division. The team knows they need to tighten up defensively heading into the final games of the season and the playoffs. Duco said the team’s always working to tighten up defensively so they can keep goals scored against them at a minimum. “We’re aware that come playoff hockey, it’s going to be tight checking and a lot harder to score, so we need to make sure we’re tight defensively,” he said. Santos also said the team has needs to improve on the defensive side of the game. “Everybody needs to find a man in [the defensive] zone and make sure they aren’t getting good opportunities and force them to the outside and give our goalies a good look at the puck,” said Santos. The Rams have six more games left in the regular season before the OUA playoffs begin.